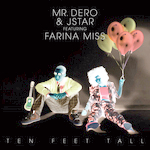 As a token for appreciation for your support, JSTAR and Tiefparterre Records is now giving out both Jstar and Mr. Dero instrumentals as a FREE DOWNLOAD! DJs, producers, singers, MCs, music lovers: Mash it up, remix it or make your own version! Simply share your results on JSTAR or Mr.Dero's facebook wall! The best reworks will win label goodie bags full of vinyl, cd´s, merch – and will appear on our upcoming mixtape!